Just as you start to think it’s time to dig the winter coat out, it warms up and feels quite like summer again. In honour of these balmier temperatures, I decided to give my new sunshine-yellow ice cream maker a go, and tried a peach recipe from Saveur (Americans know their ice cream). It turned out to be an absolute treat – perfect for this time of year, when two seasons are very much hanging in the balance but the peaches are still at their absolute best. 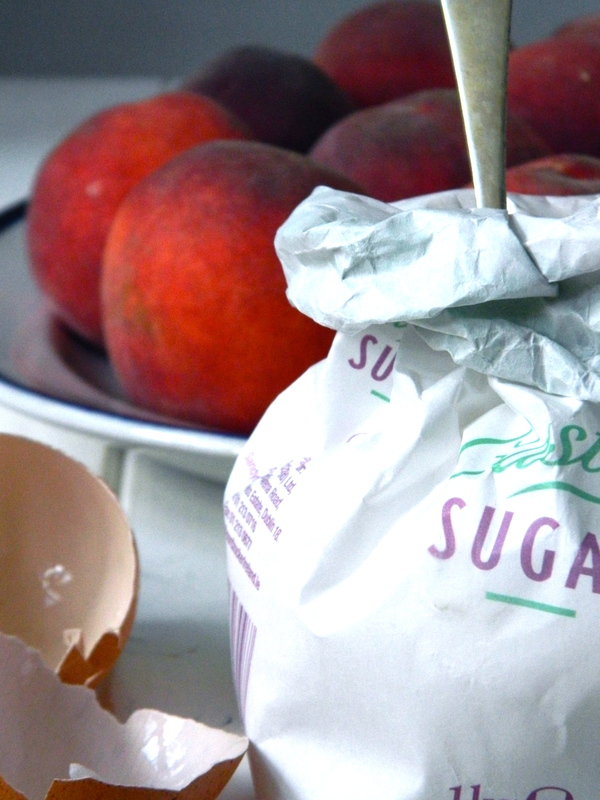 It’s an easy ice cream, and, as long as you use ripe, flavoursome peaches, is pretty much impossible to get wrong. Having now made ice cream both by hand and with the machine, I’m afraid I have to confirm that the only way to make lovely, really smooth and creamy ice cream is to use an ice cream maker. No matter how much love and double cream and hours of churning you put into it, if you make it by hand it will always have that very faint yet very cold crunch, which quickly moves from ‘sorbet-like’ and refreshing to alarming and unpleasant as the nights get cooler and summer comes to an end. Warm the milk in a large bowl above gently boiling water and bring to just a simmer – ie, some very light movement but no circulation in the liquid. Meanwhile, whisk together the eggs, egg yolks and 3/4 of a cup of sugar in another mixing bowl. Lightly whisk 1/4 cup of the hot milk into the egg mixture, then whisk the egg mixture into the remaining milk in the bowl that’s on top of the boiling water. Cook, stirring constantly with a wooden spoon, until the mixture is thick enough to coat the back of a spoon, or when it looks custardy. This takes about 15 – 20 minutes. Stir in all of the double cream while the mixture is still warm; refrigerate until cold. Combine the peaches, the remaining sugar and the lemon juice in a mixing bowl – the peel will give the ice cream a pretty rosy colour. Refrigerate. Once cold, drain the juice from the peaches and stir it (the juice) into the cream mixture. Pour this into the ice cream maker and follow your ice cream maker’s directions. Just before the mixture is set, add the chopped peaches. 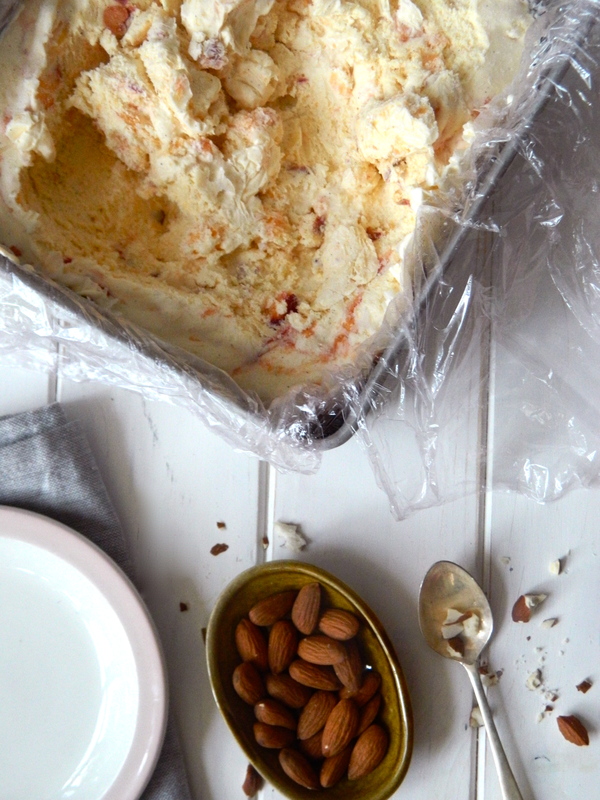 If you want it soft and creamy, eat it straight from the ice cream maker. 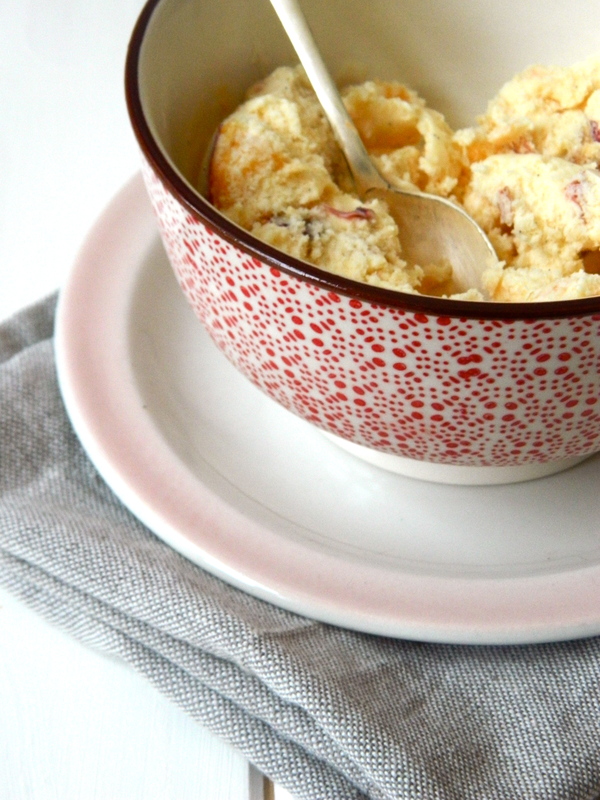 If you want it a little firmer, transfer the ice cream to a tin and freeze. Serve with the flaked almonds.